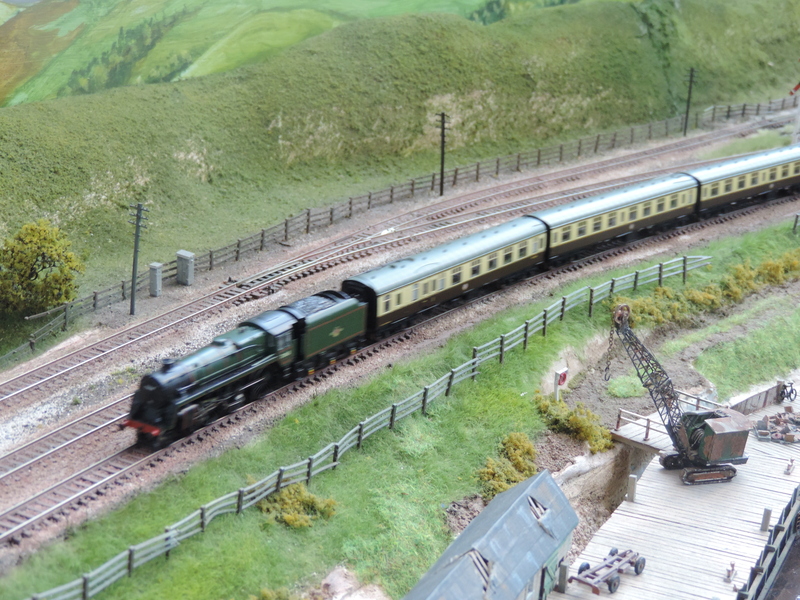 This layout is a rather special N gauge layout owned by Kevin Player and is a fictional layout depicting a typical DB Museum but what makes this layout rather special is that its all built and run in a suitcase. The lower level comprises of the Museum, with the Fleischmann turntable and Round house, together with all the features of this subject. The top level is used by Diesel traction to refuel at the rear of the scenic section. In addition preserved stock will be used to replenish the coal for the actual museum. A preserved DRG Rail car provides a tour of both the Museum facility and upper level. Over the years I have seen several suitcase layouts but this is by the far the best in terms of detail and running ability but what pushes it to the top of the pile is it’s all DCC Sound. Some of these little locomotives have a speaker inside giving them the ability to have sound which I just found absolutely amazing. 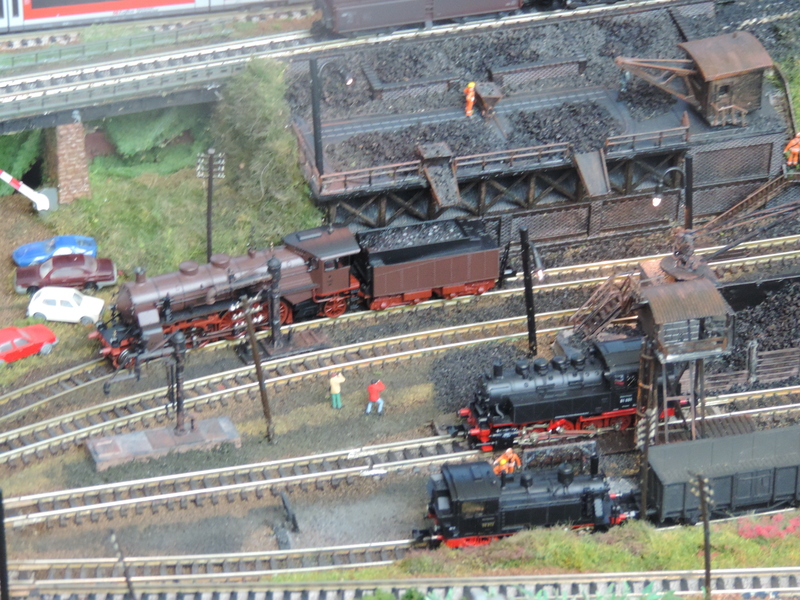 I saw several N Gauge layouts at the show which this and Broadwater Junction being a cut above the rest. Talking about Broadwater Junction thats the next layout we will be looking at. This is unashamedly a “watching the trains go by” layout intended to entertain members and public alike. 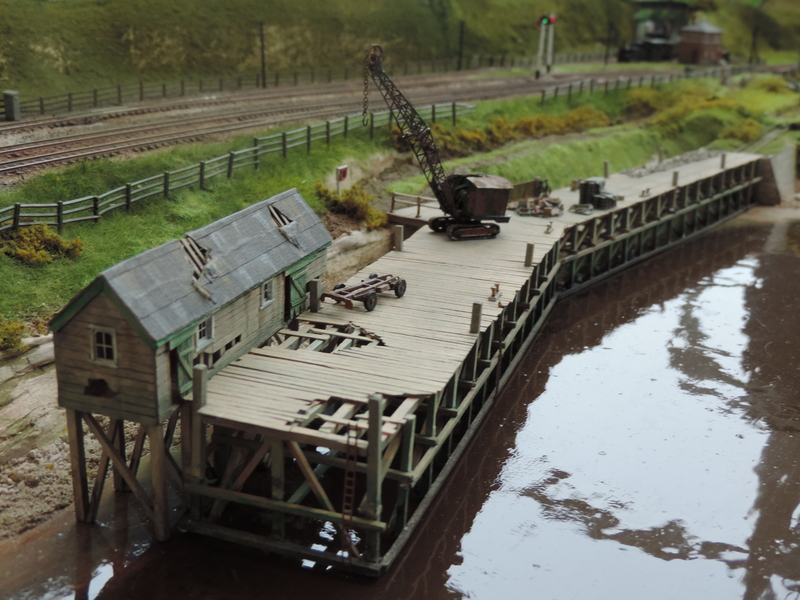 Owned by the Warley MRC N Gauge Group, they used a range of sources for its gestation: coastal and estuary lines like the Cambrian, others in the West Country as well some Scottish and Southern scenes. 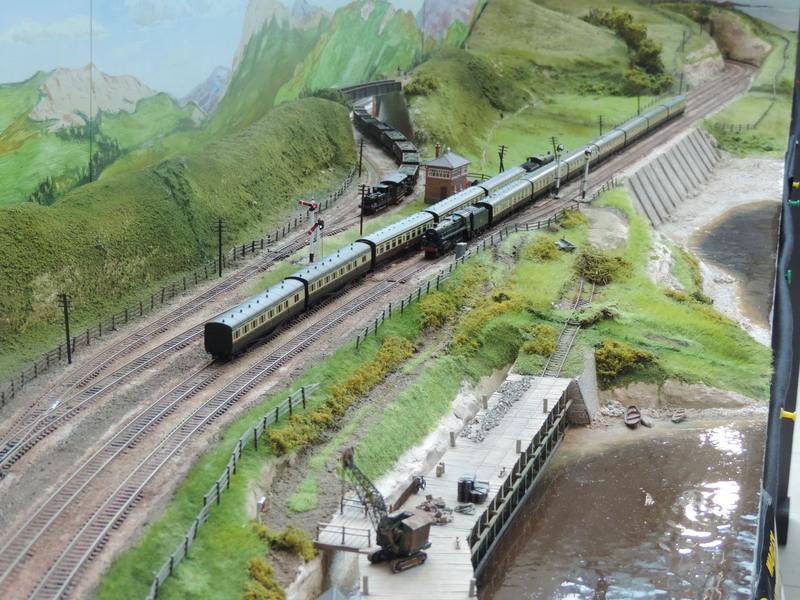 The main inspiration for the look of the line was the Dovey estuary section of the Cambrian, though the line can be run to represent any region with a quick change of the signal box (they have several todays was a GWR/Western themed one). With the siding down to the disused wharf long since close, the signalman’s job is lonely here where the branch serving a quarry heads off inland. A new design of baseboard structure was developed with open frames around the structural spine of the back scene board. This has proved very successful. Wiring is kept above baseboard level on the fiddle yard side of the back scene for ease of maintance. Ease of carrying was also designed into the layout whose 4 sections will each fit between the wheel arches of most cars. Type of baseboard structure is reasonably light with the legs also designed for lightness too. 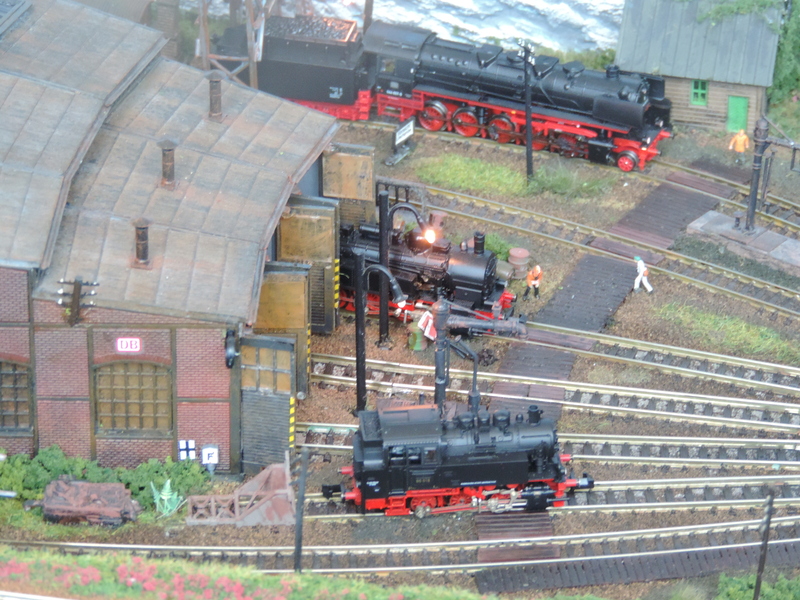 The thing which I loved about this layout is its the complete opposite to Furth DB Museum with its openness and the way its able to run long trains but still look small. Despite the simple track plan and lack of operational work this for me was the most fun layout at the exhibition as I could spend hours just watching the trains go past and with the ability to change eras and location in a flash the sky is the limit with what you could run on it. Thanks for reading, stay tuned for more layouts from this great show soon. love the idea of a ‘suitcase layout’ simply inspired! Its a brilliant idea, I was amazed by the layout and the fact that the tender locomotives were all DCC sound. 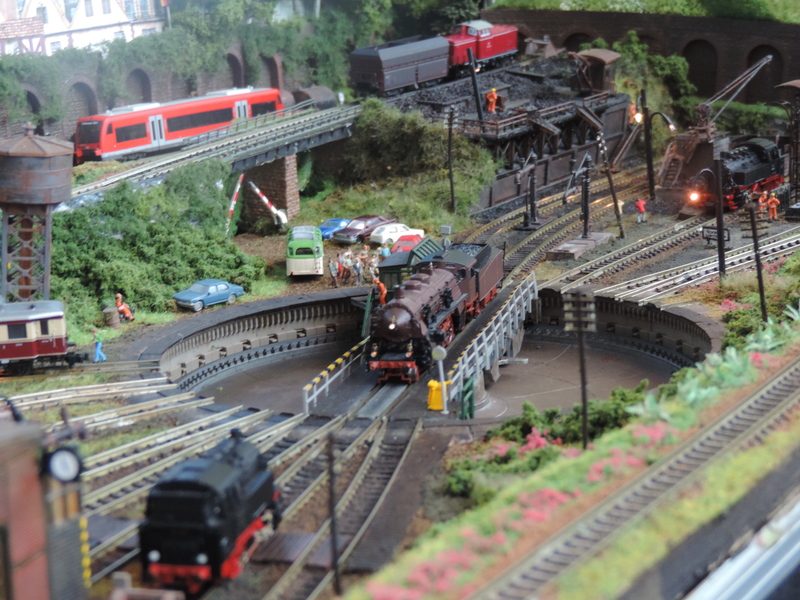 I did some research into the layout and it has won loads of awards from places like the N Gauge society.